The Patriot is a fairly realistic film about the Revolutionary War (ya know - the one where America became a nation). The movie stars Mel Gibson and Heath Ledger. This movie is full of engrossing battles that will show you both the triumphs and horrors of war. 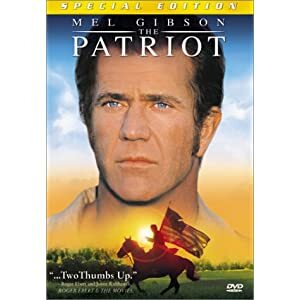 Mel Gibson's character is a war hero that has sworn not to promote hostility anymore, for reasons which become clear during the film. He is forced to take arms once again to protect his family, and to avenge his son's death in the hands of the British soldiers. He joins the war as a militia leader and inspires his men with his bravery and skills.